When Jason and I first came up with the idea of creating a Christians Against Christians T-shirt, I thought it was brilliant, in that ironic, witty way we think we are brilliant at some point around midnight. Not only does the slogan make people stop and think, scratching their heads and asking questions, it says something that I feel personally called to communicate: Not all Christians are like that. It’s deeply important to me—not that everyone decides to think Christians are great, but just that they don’t put us all in a box and dismiss us immediately because of what we believe. We’re not all socially conservative Republicans. We’re not all judgmental. Some of us are just trying to figure out what it means to try to live more like Jesus, because we believe that’s the only way to make ourselves—and the world—better. Some people along the way have questioned my use of the Christians Against Christians phrase, but I have defended it, suggesting that it’s not an idea meant to be dissected, just one to grab some attention and propel people off into thinking more deeply about related issues and ideas. But recently, I’ve started to wonder about it, myself. In the small group Jason and I lead, we’ve been studying Ephesians; the last time we met, we looked at Ephesians 4, which has this as its overarching headline in my study Bible: “A call for unity in the body of Christ.” Harrumpf! I thought. As I prepared the study, I was feeling pretty bitter about the possibility of that kind of unity. In fact, it was a Christians Against Christians moment for me. Earlier that day I had read two blog posts that made me furious. Both were written by Christians I feel some sense of alignment with, about other Christians who were attacking them in some way. In a post at Adventures of the Called, Becca writes about a letter that arrived from another church in her community, regarding Becca’s upcoming installation service as a pastor in the Lutheran Church (ELCA). In the letter, the leadership of this local Baptist church quoted Bible passages about how women are to be kept silent; how Becca, by seeking to become a pastor, is “shameful;” and how the church that has hired her should cease to call itself a Christian church. It’s been a couple of weeks since I first read this post, but I still can hardly type these words without feeling a seething anger and even hatred for the men who wrote this letter, in the name of the God I believe in. Indeed, at that very event, there were folks gathered outside in the cold to ‘preach the truth’ over against (what they understand as) the message of C21 (which they understand as a coherent, evil whole). While these stories made me want to claim the Christians Against Christians slogan more than ever—they were perfect examples of the type of extreme Christian that is dominating society’s understanding of what Christians think and how they act—I also realized this: They, too, are Christians Against Christians. They, too, think they’re right, and are determined to show those “other believers” how they’re wrong. And it feels evil. It’s about humility and patience, not proving right and wrong. It’s about relying on the Spirit to bring peace and unity, not on our own skills, intelligence and strategies. I want to believe that approach—my own humility about my stance, and being more patient with other Christians—can change things more than my outspoken frustration and anger. But sometimes it’s really hard to imagine. And at the same time, I feel called to speak out—not to condemn Christians who anger me as much as to open the minds of those who don’t believe. But maybe my Christians Against Christians approach isn’t quite the right way. Maybe there’s an approach that blends the speaking out with the humility and patience. In fact, it seems to me that’s what Jesus modeled. Awesome. You’ve put into words what I feel quite often and am not eloquent enough to express. Thank you for writing this! I get so mad at how one type of Christian has become not only representative of us all, but also bullies about what anyone who follows Christ MUST believe. 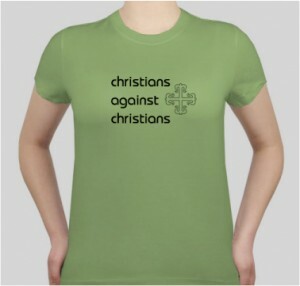 It drives me mad, and I so would have bought, like, a hundred of your “Christians Against Christians” shirts. And at the same time your insight and conviction is right, our God cherishes unity and somehow being kind and compassionate WILL work even though in my head it doesn’t make a lick of sense how. I appreciate your references to unity and humility. I think we are always in a learning process of what it means to be a disciple of Christ and we always want to think that we have these virtues and no one else does. That antagonism divides us more than it unites us, whatever our larger beliefs on other issues. Thanks for your thoughts today. While I understand the idea behind “Christians Against Christians”, I think it may be the wrong kind of approach for a t-shirt/slogan/label/whatever. Just as Democrats couldn’t win in 2004 by just being against Bush, I think it’s so much more powerful and productive to define yourself by inclusion and supporting what you do believe in rather than by what you don’t agree with. I guess that’s why I’ve mostly identified as UU. Thanks for this post. After studying Romans, especially chapters 14 and 15, I’ve been convicted to do what benefits and builds up fellow believers. If I’m not building up someone, even with a carefully worded and loving critique, then I’m most likely justifying myself and my own point of view. Whatever you decide to call it I hope that you’ll continue to comment on things that other Christians do that you don’t agree with, or that you don’t believe represents “all” Christians. Although it seems obvious that all the people of a faith wouldn’t have homogeneous beliefs, the truth is that for me, a non-observant Jewish New Yorker, your point of view is a new and refreshing one. I remember back to the election – I was very unsure about what your political beliefs might be – and I was surprised to learn (from your tweets, of course) that we stand on the same side of many issues. I suppose that I knew that the very vocal “Christian perspective” that many of us hear in the political arena wasn’t the only one, but it wasn’t a conversation I’d ever had. For me, your discussion of these issues is incredibly eye opening. I can’t claim to always relate to what you’re writing about when it comes to your faith, but I certainly do welcome being pushed to think about things in a different way and want to embrace our differences as well as our similarities. One of the reasons I sort of disavowed Christianity and religion in general was precisely those individual Christians who felt compelled to tell me how or what to think, what I was doing wrong, etc. I didn’t like it, so I just walked away. But walking (or running) away isn’t really a solution. It doesn’t help find new approaches or work to change the dialogue. It’s harder to stay and work from within (both within your own self and within a specific community) – and it’s ultimately more rewarding. I feel that the things I’ve read here on your blog about faith, God and religion (and from the very thoughtful and intelligent people who comment) have given me more hope about Christianity as a whole than anything else lately. Also, ditto what Jason said: I think it’s so much more powerful and productive to define yourself by inclusion and supporting what you do believe in rather than by what you don’t agree with. I guess that’s why I’ve mostly identified as UU. I think you are really on target even though it proves very difficult in practice not to turn people (especially those who disavow me in my attempts to be authentically faithful to Jesus’ calling) into “its” in my planning and “0′s” in my equations. Jesus was/is incredible at seeing everyone as a real person. We who claim him are tragically poor at following that example. As you, and others who are commenting say, it does not mean avoiding honestly stating differences, it means remembering we are dealing with real people who God loves which puts us both inside a pretty important circle. Thanks for the reminder. I wish what you are challenging us to do and be was even “halfway to normal.” Maybe it is “all the way to normal,” just not even half way to average. When I first read your Christians against Christians slogan I woo-hooed it, but in the back of my mine I had a little pricker about being the one to cast the first stone. You put my little pricker into a well articulated post. Before I start responding to individuals, I thought I should clarify that this T-shirt doesn’t actually exist (as far as I know). My husband just went to a website that lets you design your own T-shirts, and this is the sample image of what it would look like. Jason, what you say here is very true, and a perspective I want to embrace more actively in my life: “I think it’s so much more powerful and productive to define yourself by inclusion and supporting what you do believe in rather than by what you don’t agree with.” I can see why the UU church is appealing for this reason, but I also think other denominations and churches can definitely accomplish this inclusiveness more, too. We all have much to learn from each other. lisa, I’m glad you like the post and that it inspired thoughts for your blog. I love how bloggers can be doing what they do and sharing/feeding one another in the process. Ron, all I can say is YES: “Jesus was/is incredible at seeing everyone as a real person. We who claim him are tragically poor at following that example.” Sometimes I pat myself on the back because I see all of the marginalized people in our society as very real people that Jesus loves, but then I turn around with anger toward Christians who think and act differently. It’s a different brand of hypocrisy, but it’s still hypocrisy and I need to do something about it. Elaine, yep. I ignored the pricker because I just wanted the slogan to be clever and thought-provoking. Thankfully, I was reading Ephesians 4 when I was reading those blog posts that upset me so much. Thankfully, God is patient with me. I totally understand what you’re saying Kristin. Sometimes i wonder who we are fighting and why. We shouldn’t be fighting other Christians but at times, some Christians stray away from what is real and distort the Bible and its teachings to they way they think it should read. I’ve visited a church that believed people who were divorced could be saved, just not in their church. They also believed if you re-married, you have to divorce the person you are with and go back to your ex-husband/wife. My jaw dropped. How can people who are so called Christians have this kind of distorted thinking? It’s like the Baptist churches that support gays. The Bible clearly teaches against it. Anyways, love your blogs! It’s so hard. It’s even harder to read that non-believers hold our tiffs and infighting (which spills outside the church conversation) against us, but why wouldn’t we? If we can’t love our brother or sister we don’t agree with, then how can we logically love others? Let me add…though the world can’t expect us to love, we are blessed in that God doesn’t operate logically. Kristin, I am reading some Madeleine L’Engle (A Stone for a Pillow) and here’s the most perfect quote: “There are times where I may have had it with Christians, but I do not want the kingdom to fall.” Says everything I wanted to say! Bella, I’m glad you found my blog and enjoyed the post! You’re right—the Bible is being distorted all the time by people—I do it too, even when I’m trying hard not to. I’m not sure there’s any way to completely avoid that, other than to keep praying for wisdom and discernment as we read. Regarding your last statement, about the Bible and homosexuality, I’m a bit confused about what you’re saying. I’m not a theologian, but from my perspective the Bible isn’t completely clear about much of anything, other than the absolutes: loving God and loving your neighbor. When you take into consideration, for example, who Paul was specifically writing to (and when, where & why), the applications for today get even more fuzzy. That doesn’t mean the Bible isn’t absolutely relevant in our lives now, 2009, in the US. And it doesn’t mean that all Christians have to believe all the same things to be a part of the same family. I guess that’s the main point of my post—that and making sure we don’t hurt one another in the process of trying to do what we think is right. at my cousin’s bar mitzvah (i have a pretty diverse family) part of the ceremony is that the torah scroll was handed to him from his grandparents, to his parents and then to him. reformed jews understand that the torah is meant to inhabit different cultures at different times and that the words themselves are never to be placed in the same absolute nature as the G-D to whom they speak. this is very different from the islamic belief in the absolute nature of the qu’ran. the qu’ran is the very word of allah that is never changing. the real distortion in many forms of biblical literalism in christianity is the belief that the bible is the absolute word of god as muslims view the qu’ran. this is not true at all. the unchanging and perfect word of god is christ alone for whom the scriptures are only a witness. this means that the scriptures are not perfect (as any biblical scholar should tell you if he or she is honest), nor should we devise fancy speculative doctrines to assert they are. biblical infallibility is merely a parallel authority to papal infallibility and both are distortions of the function of scripture as something god-breathed, not verbally given. once you embrace the limited and flawed nature of scripture as it has inhabited culture after culture only to serve the purpose of being a witness to god alone, you have permission to go deeper into it and understand god more closely. but if you limit yourself to a culturally mediated literalism, you by nature distort the words for the purpose they are to serve. the words in scripture have become your god in this instance, not the god for whom they are a witness. that is at it root idolatry and i am a christian who hacks at this poisonous root often and intentionally. I think something that I feel important in christian vs. christian is letting go of the need or the feeling of having the “right” to be a certian thing when entering into community or discussion. I think this is where we (even though I don’t like to use the word “christian” to label myself…baggage that goes with it) have skewed things. “Standing: a place where i can confess my faith – which means that i have to be able to show up with all of my identities. i need a place to de-compartmentalize. I think this and Seth’s whole discussion really, gets to the heart of the matter. It is the need to come into community, discussion, ect. and let go of the right to be right, but allow everyone to be wrong. in christian vs. christian that isn’t that allowance. on both sides if we ALL are honest. I like that Drew pointed to the fact that there needs to be an understanding of scripture and the what is absolute. I guess it is the PoMo/EC in me, but for me Drew couldn’t be more correct. I think once we embrace the thought that we don’t own or have the market on any thing absolute this (should or hopefully) free ourselves from a hold on one side or another. However, I realize what I just stated is a lot where the christian vs christian thing comes out of a lot of times. You know how there are those bibles that have all of Jesus’ quotes in red. It’d be interesting to review all those quotes and count how many times He says “Do this” versus how many times He says, “Don’t do this”. So much more action can be accomplished with “Do This” rather than with the “Don’t” (and trying to figure out what needs to actually be done so that you can accomplish the “Don’t” activity). So much easier to be For-Something, rather than to be Against-Something. Looking forward to the “People for __________” T-Shirt (I’ll take an XL). Drew, I never would have been able to put it all together in my head then articulate it, but I think you’ve hit on what’s at the foundation of my belief about the Bible: “once you embrace the limited and flawed nature of scripture as it has inhabited culture after culture only to serve the purpose of being a witness to god alone, you have permission to go deeper into it and understand god more closely.” Thanks for your thoughts and wisdom, and for bringing it all into context by looking at other belief systems, too. MoJoJules, wow, Seth Donovan’s quote is a pretty amazing way to think about a place for confessing your faith, while simultaneously embracing all of who you are. “I need a place to de-compartmentalize.” So powerful and true. And what you wrote about the work we need to do as the Church: “It is the need to come into community, discussion, etc. and let go of the right to be right, but allow everyone to be wrong.” Radical and absolutely necessary. My mind is buzzing with so many thoughts & ideas related to this. Thanks! Jonathan, thanks for the “bravo.” :) Once this vision of unity came together in my post, I began to see it everywhere, in a multitude of scenarios and forms. Amazing.